DOKA Contemporary Arts | Hiroko Ohno -Japanese-style Painting- "Letter from Hiroko Ohno in New York"
Received Award of Excellence for graduation production. Received Award of Excellence for course completion production. Collected Works of Hiroko Ohno published by Kyuryudo Art Publishing Co. (An enlarged and revised edition published in '98). "The World of Beauty - Hiroko Ohno" televised on NTV. "The Morning of Beauty - Hiroko Ohno" televised on NHK. Decorated with "the Medal with Dark Blue Ribbon"
Completed "An Apple of Newton The Koishikawa Botaical Garden" which was commissioned in 2002 for the president's drawing room of Tokyo University Yasuda Auditorium. The landscape painting of the Koshikawa Botanical Garden was done on the balcony of the Koishikawa Annex of the University Museum, the University of Tokyo (formerly the Medical School Building), an important cultural property of Japan, and was installed in the drawing room after completion. 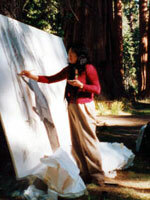 Stay and paint in all over the world, like USA, Kenya, Mongolia, Australia, Namibia and etc. I was published on the July edition of "Bijutsu no Mado"(Japanese Art Magazine). I was published in the corner of "Round Chelsea, New York in this spring" which was written by Kei Tatejima on this month edition of "Bijutsu no Mado". My work will appear in the RED DOT Art Fair ( March 27- 30 ), to be represented by Susan Eley Fine Art. If you are going to Art Fair this weekend, I hope you can stop by the RED DOT Art Fair. The RED DOT Art Fair will be at the South Park Hotel (Room 210 ),122 East 28th St.between Park & Lexington.